This article shows you how to import data in a Trello board to a Roadmunk roadmap. The first step in the import is exporting data in a Trello board to a CSV file. Here's a snapshot of what a Trello board might look like. 1. 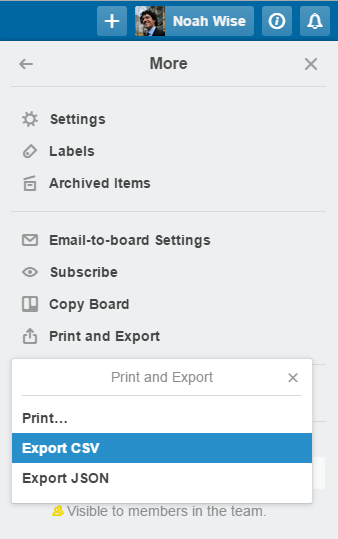 On the Trello menu, click Print and Export, then click Export CSV. For more details, go to Trello's exporting walkthrough. Here's a snapshot of what the CSV file might look like. If Roadmunk will be regularly updated from Trello, we recommend renaming the CardID field in the CSV to ExternalID. Roadmunk uses this field to match existing items so they're updated instead of overwritten. Once changes have been made the CSV, you can start the import to Roadmunk. For details, see Import items from CSV and watch the Importing from Trello video below.